I am going to try some wide angle, super DOF macro with 10x microscopic objective as the relay. Currently I am at the studying phase and encountering some issues. 1. Board lens selection: The following two available lens are my candidates. Not sure the performance of those two applying to my DSLR camera. Does any one has the experience of using those two ? or suggestion for selecting other board lens ? The objective could be 'sleeved' by an external tube, to which, adapters appropriate to your requirements could be attached at either end. Are you intending to use an infinity-corrected objective and a tube lens in the configuration? It sounds to me like you're working on an approach that has not been talked about in this forum, at least in the terms that you're using here. As I understand your idea, what you're thinking is to use a very short focal length lens to make a tiny image, which you then magnify using a 10X objective to fill the sensor of your DSLR. The lenses you're talking about are designed to be sort of telecentric on the sensor side, with exit ray cones that are not very far from parallel to the optical axis. The DSL227 at your first link specifically quotes a Chief Ray Angle of 10.8°, which I assume means tipped at 10.8° degrees to the optical axis at the edge of the field. "Not very far from parallel" is good because it means that all the light leaving the short lens stands a chance of getting into the objective to be relayed with magnification back to the DSLR's sensor. But the devil is in the details. A 10X objective at NA 0.25 has an entrance cone with a half-angle of 14.5 degrees, so it should work OK. However, a 4X objective at NA 0.1 only has a half-angle of 5.7 degrees, so I would expect quite a lot of vignetting in that case. Now it seems to me that there's a bit of conflict here. If you take a 1.96 mm front lens (the DSL227) and stick a 10X magnifier behind it, what you've created is essentially a 19.6 mm lens with an effective f-number equal to 10 times the value that's set on the ring of the front lens. f/2.0 becomes effective f/20 and so on. An ordinary 18 mm kit lens set on f/22 would give you a bit wider AOV at the same DOF, with no fiddling around. On the other hand, if you take a 1.96 mm front lens and stick 4X magnification behind it, then you have an equivalent 7.84 mm lens. That will give an AOV much wider than the 18 mm kit lens, nominally 180 degrees across the width of an APS sensor based on the spec of a 5.6 mm image circle for the front lens. So, the AOV is good, but at least with that particular lens it runs into the vignetting problem mentioned above. As far as the adapters are concerned, I don't know a good collection of parts. I guess what you're looking for is a female C-mount that would either clamp onto the barrel of the objective or reach down and around to something that fits the mounting threads of the objective. Something like those Thorlab cages might be made to work, but again the devil is in the details. If this were my problem I'd be prototyping on an optical bench first, to make sure that the lenses would play well together. To avoid the vignetting problem, you're going to need a front lens that's very close to telecentric on the sensor side. The lens at that first link seems marginal as discussed above, but at least it does specify the telecentricity. The other one I can't find a spec on. Thanks for the information. That helps a lot and I need to think about those carefully. Sorry that I didn't describe my question clearly. What you guess is correct. The relay system includes the 10x infinite objective and the tube lens. I will think about the mounting method Craig provided. But currently I have a different way in mind, even though that is probably not a good idea. Currently the connections of my objective, tube lens and bellows follows morfa's method, including the adapter for the tube lens. This adapter has 49mm female thread in both sides. 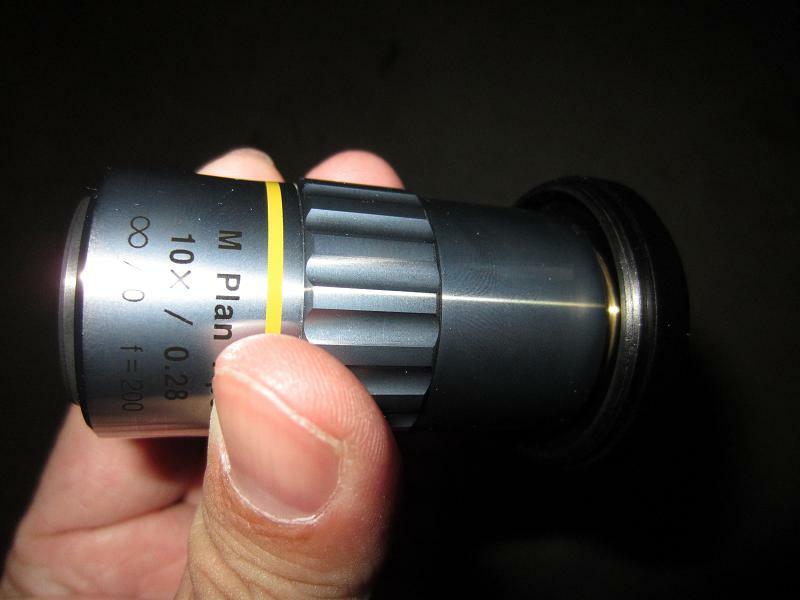 My 10x objective's thread is 26mm and I use a M26-M42 objective adapter ring followed by a M49-M42 step down ring to connect the objective and the 49mm female-female adapter. Considering connection between the objective and the broad lens, I am thinking of the following ways. 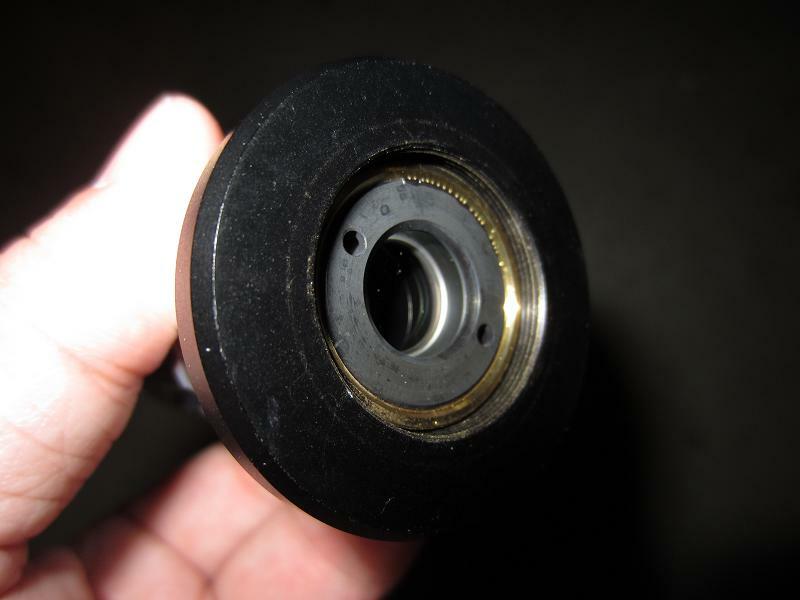 First of all, I reverse connect the M26-M42 objective adapter ring as shown below. Then I ordered some cheap rings (M26-M30 step up + M30-M49 step up + M49-M49 double male) to connect the objective and the tube lens adapter. Those ring adapters are on their way to my house and I am not sure whether that would work because the male thread of the M26-M30 step up and the female thread of the M26-M42 objective adapter ring have different TPI. Need to see how this improper mount affects the relay system. For connecting the objective to the broad lens, I need a M49-M42 step down, two or more M49 spacer rings. Then I just need to worry about the connection between C mount and the 49mm male thread. This may require some female-female ring in between and I already have one for 39mm.